Follow this advice to get the most out of illustrators. You’ve been browsing different design portfolios for ages, and you’ve finally found the perfect illustrator to collaborate on your latest project. But how do you make sure you get the very best from them? Read on for five tips from leading agencies on how to commission illustration the right way. Commissioning great illustration is about great communication. To make sure this happens, set a clear brief covering exactly what you want in an image and the style, as well as the timeline. Make it plain why you're commissioning that person for that job, and give them as much information as possible to let them interpret that creatively. Nothing makes for a better working relationship – whether between a brand and agency, agency and illustrator, or all three – than trust, respect, and dialogue. "It's a balance between respect for who you are as a brand and flexibility to impose no limits on the creativity," says artist Dennis Osadebe. "A great client is one who can communicate effectively and understands the importance of allowing the artist to embrace their talent." When commissioning illustrations for packaging design, remember the canvas will generally be pretty small. You have to strike a balance between work that's suitably detailed as to be interesting close up, but is also bold, visible and legible enough to stand out on the shelf. Hired Guns Creative and Thirst Craft are two branding agencies that specialise in drinks clients. According to Hired Guns Creative, specialisation was initially a scary move, but has been "a fantastic thing." 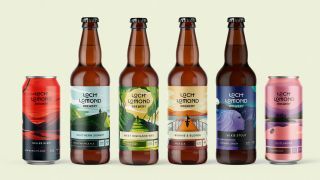 Thirst Craft – the agency behind the branding scheme for Loch Lomond Brewery that appears in the opening image – echoes its sentiments. "This is our story now, and it's given us a really deep understanding of the drinks industry now and the right questions to ask people," says creative director Matt Burns. According to Canadian agency Hired Guns Creative, augmented reality technology is likely to become a big innovation in illustration across alcohol packaging, and is already being used across Australian winery's 19 Crimes wine, which uses an app to show portraits of real former criminals on the labels. This article was originally published in Computer Arts, the world's best-selling design magazine. Buy issue 279 or subscribe.